At the stroke of midnight on March 6, 1957, as the new day began, so, too, began a new nation. It was the moment at which the Union Jack was replaced with a flag of red, gold and green with a distinctive black star at is center. The British-ruled Gold Coast was now a self-ruled country, Ghana — the first sub-Saharan nation to claim its independence from colonialism. It was a historic event, heralded as the force that urged other sub-Saharan African nations forward in their quests for liberation. What is not as widely discussed is the impact that Ghana's independence also had on America's civil rights movement, or the impact that black America had on Dr. Kwame Nkrumah, the man who would ultimately lead his country to freedom. Most African intellectuals of that era completed their tertiary and postgraduate education in Europe. It was customary, if not expected. Ever the visionary, Nkrumah set his sights on America. He enrolled in Lincoln University, which has the distinction of being one of America's oldest historically black colleges. There he studied economics, sociology and theology; he also received an informal education in the politics of race and the plight of black people in America. When Nkrumah was not in school in Philadelphia, he lived in Harlem, N.Y., where he earned a meager living by working such odd jobs as selling fish on the streets and waiting tables on merchant ships. Nkrumah frequented black churches in Harlem and Philadelphia. He aligned himself with black political organizations such as the NAACP, where he met and began working with the scholar W.E.B. Du Bois, who quickly became a mentor to Nkrumah. Upon completing his studies at Lincoln University, Nkrumah attended the University of Pennsylvania, where he earned master's degrees in education and philosophy. It was there that an already politicized Kwame Nkrumah began to shape his ideas of Pan-Africanism as well as his vision for a liberated and unified continent, a place to which all people of African descent in the Diaspora could return, and a place they could consider home. Marcus Garvey, the Jamaican activist who advocated black self-reliance in the United States, was another instrumental figure in Nkrumah's life and education. "But I think," Nkrumah noted in his autobiography, "that of all the literature that I studied, the book that did more than any other to fire my enthusiasm was Philosophy and Opinions of Marcus Garvey. Garvey, with his philosophy of 'Africa for Africans' and his 'Back to Africa' movement, did much to inspire the Negroes of America in the 1920s." 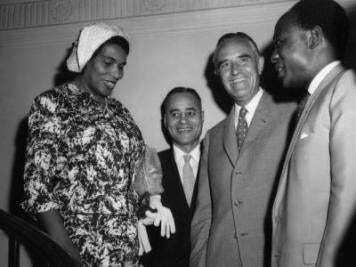 During Nkrumah's time at the University of Pennsylvania, he helped to establish its African-studies section. He also established the African Students Association of America and Canada, and served as its first president. Given all this, it is no wonder that some of the most notable black people in American history were present to witness the moment of Ghana's independence: U.N. Undersecretary for Special Political Affairs Ralph Bunche, also a Nobel Peace Prize recipient; Sen. Charles Diggs; Rep. Adam Clayton Powell Jr.; Mordecai Johnson, the first black president of Howard University; international labor activist Maida Springer; Horace Mann Bond, the first black president of Lincoln University and the father of Julian Bond; Martin Luther King Jr. and Coretta Scott King; and Lucille Armstrong, representing her husband, Louis, who could not attend. Also present was then-Vice President Richard Nixon. A rather telling story has been written numerous times of how Nixon approached a group of black people whom he assumed to be Ghanaians and asked, "How does it feel to be free?" "We wouldn't know," they responded. "We're from Alabama." Their response only emphasized a remark made to the vice president by Dr. King at a reception that was held two days prior to independence. It was the first time the two had ever met. "I want you to come visit us down in Alabama," King said, "where we are seeking the same kind of freedom the Gold Coast is celebrating." The repeated reference to Alabama and freedom was especially poignant because Ghana's independence occurred virtually on the heels of a major civil rights victory there: the Montgomery Bus Boycott. The yearlong boycott began on Dec. 1, 1955, when Rosa Parks refused to get up and give her seat on a bus to a white person, and effectively ended in November of 1956, when the U.S. Supreme Court issued a ruling in which it was declared that the laws of segregation on buses were unconstitutional. In his book African Americans in Ghana: Black Expatriates and the Civil Rights Era, author Kevin Kelly Gaines writes that "The fulfillment of Ghanaian and African demands for national independence informed many African Americans' struggles for equal citizenship." During a radio interview that King gave while still in Accra, he said of Ghana's independence: "It renews my conviction in the ultimate triumph of justice. And it seems to me that this is fit testimony to the fact that eventually the forces of justice triumph in the universe, and somehow the universe itself is on the side of freedom and justice. So that this gives new hope to me in the struggle for freedom." Ghana's close relationship with black America, which was forged by Nkrumah, has continued. Du Bois, who was not at the independence celebrations because the U.S. government refused to issue him a passport, moved to Ghana in 1961 and spent his remaining years here. The list of African Americans who have called Ghana home is long and includes such people as poet Dr. Maya Angelou, writer and Pan-Africanist George Padmore, writer Julian Mayfield and lawyer-author the Rev. Dr. Pauli Murray. In 2001 Ghana's parliament passed "the Right to Abode"; it is legislation that affords any individual of African descent the ability to live and work here indefinitely. Ghana is the first African country to make such an overture to people in the Diaspora. "Africa's future is up to Africans," U.S. President Barack Obama said when he addressed Ghana's parliament in July 2009. "The people of Africa are ready to claim that future. And in my country, African Americans — including so many recent immigrants — have thrived in every sector of society. We've done so despite a difficult past, and we've drawn strength from our African heritage." As Obama spoke, I couldn't help thinking how fitting it was for the first black president of America to have chosen Ghana as the destination of his first official visit to Africa. It was a wonderful tribute to a long-standing and important relationship that has defined our mutual destinies. John Dramani Mahama, vice president of Ghana, is writing a nonfiction book about Africa. This article has been updated to reflect the fact that it was a passport, and not a visa, that the U.S. government refused to issue Du Bois in relation to the independence celebrations mentioned above.